Pewi Alfred (Great throwing power) is taking part in the Mother Language Meme Challenge creating memes in the Kwak̓wala language. Without a doubt, the meme challenge has been an additional way to engage the junior kindergarten to grade 7 students that she teaches the language at the T̓łisa̱lagi’lakw School in Alert Bay, British Columbia in Canada. Ever since she was 19 years-old, Pewi, who comes from the Nimpkish People, has been a language instructor in the community. Much of her language learning can be credited to her grandmothers and others, who mentored and taught her how to read and write in the language helping her to build a strong vocabulary. For the past several years, she has been contributing audio, interviews, words, books, and songs to the Kwak̓wala Community Portal at First Voices. In addition, she has been assisting at the local museum the U’mista Cultural Centre. In an interview with Rising Voices, she talks about the role that creating memes has had in teaching and helping her students enjoy the language learning process. Pewi is a firm believer in language revitalization and preservation, and he feels that it is worthwhile to have fun together in the process. She said, “Let the guard down, let’s work together to save our language. Let’s paddle one canoe to get to where we want to go.” For the #MemeML Challenge, she has been primarily sharing and tagging this memes on Facebook. Rising Voices (RV): What is the current state of your language both offline and on the internet? Pewi Alfred (PA): Kwak̓wala is not used at home, as many do not speak the language. I use language as much as I can when online, sharing songs, dance translations and short conversations with my cousins. We also do our best to text in our language with the words that we know and have learned. For up to 7 hours a day when teaching at our local band school I teach 65 awesome students songs, dances and words using the Total Physical response method. We are going to begin teaching an afterschool class again to help learn, read and write. We hope for dedication and commitment from the community because I feel it’s a need, but also that people are getting more interested and enthused. I feel these memes are a good start for inspiration and encouragement. RV: Why did you decide to participate in the Mother Language Meme Challenge? PA: My boss sent a link for the meme challenge through email. I quickly jumped on the opportunity and feel that it is important to always encourage language use, and to promote others to use it while having fun. It needed to begin somewhere and feel that everyone is enjoying it! This is a bright idea that others quickly took me up on my challenge and began adding right away. I also sent to many other language speakers in our area and they are now creating and adding by the day tagging me in their posts. I am going to begin creating my own memes along with GIFs once I figure that part out with my intermediate students. They are getting really good at speaking and reading and have seen all that I’ve added so far and find humor in it. They have some good ones to add now. I feel that role modeling for them has had a great positive impact on them to share who they are as a Kwakwa̱ka̱’wakw. RV: Who would you like to challenge to create a meme in this language? 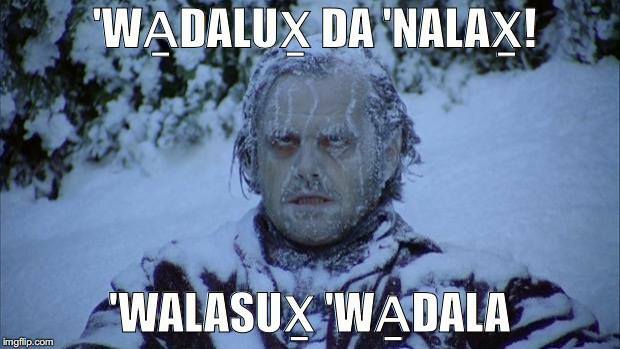 PA: As I have said above, that I have shared with other Kwak̓wala language speakers. All of them send their memes to me and we challenge one another daily, some with humor and some serious obvious words that most people love to learn, anyway. It’s a very awesome tool and another way to share our language with others. I am not sure if others are sure they are learning but they sure are having fun reading them. Now that I think of it, I would love to get the elders of our community to add memes along with us, we cannot do it without them. Find more memes from the Mother Language Meme Challenge in a variety of global languages by checking out the #MemeML hashtag on Instagram, Twitter, or Facebook. There is also a Facebook group for the Challenge with contributions from all across the world.